The certification mark is awarded within the framework of voluntary testing and certification. 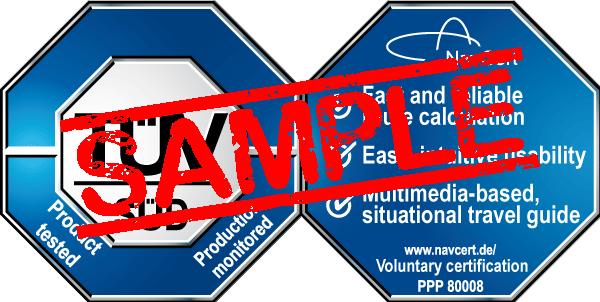 During an annual inspection of the production site NavCert examined if the customer implemented the mandatory quality management methods and if he meets all requirements concerning the underlying standards. All proposed features have been tested in regard to their accurate functionality. This included tests to see, if the user received the expected result when using a specific feature. Multiple different route calcuations have been conducted over a certain period of time, based on predefined goals. The results have then been analysed in regard to accuracy. Furthermore, for a substantiated statement testing included all featured options for routing. The multimedia-based contents (pictures, text paragraphs, voice features) were randomly tested. Another focus was on position based replay and general presentation of contents.